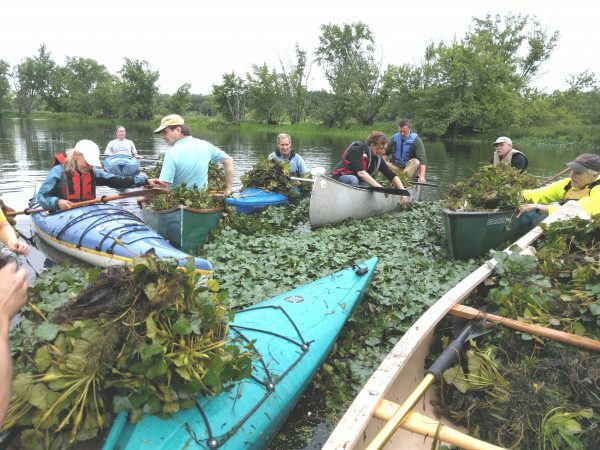 On Saturday, June 15, from 10 a.m. to 12 noon, paddlers will return to the Floating Meadows to remove emerging water chestnut plants. This invasive species endangers our local freshwater marshland. Since plants are still small at this early stage in the season, removing them now saves much labor later in the summer. The launch site will be the usual one at 181 Johnson Street in Middletown. For information on possible last minute cancellation, check back on this post or call 860-398-3771. Paddlers find this is to be a fun, gratifying activity. Plus, you will meet some of the nicest people you’ll ever encounter. Bags and gloves will be provided.